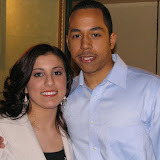 On Sunday, March 19, 2007 we were thrown a shower at the “Circulo Espanol” located in Astoria New York. We had such a great time and thank all those you participated in putting this together for us. Click the image below to view the photos from this event.